CEO Robbie Cape said the investment will be used to meet demand, build new capabilities and ensure high-quality care. 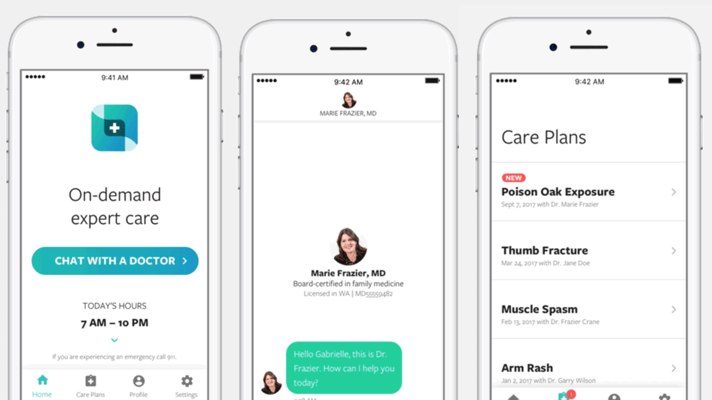 98point6 — a Seattle-based startup that offers an on-demand, texting-based primary care service for consumers and plans — announced this morning that it has closed $50 million in Series C funding, bringing the company’s total backing to $86.1 million. The round was led by the Merchant Banking Division of Goldman Sachs, with additional support from the company’s prior backers. Robbie Cape, 98point6’s CEO and cofounder, told MobiHealthNews that the new investment will help his company achieve three main goals: scaling and expanding the platform to meet “overwhelming demand;” introducing “an exciting roadmap of capabilities” to provide each patient a more complete continuity of care; and ensuring that the care provided to patients through the platform is of high quality. 98point6’s technology builds a patient profile automatically through patients’ text-based responses, relieving the company’s physicians from time spent gathering the initial patient history, updating their charts, or performing other administrative tasks. Instead, the physician steps in to speak with the patient when it’s time to diagnose, treat, or answer health-related questions, all through a secure in-app messaging system. Afterward the patient receives a personalized care plan, including prescriptions and lab work if necessary, or is referred to a primary care practice for in-person care. 98point6 launched its service in May of this year, and according to a statement has since contracted with 27 companies. The platform is currently available in 40 states and Washington DC, but is expecting coverage across all US states by early 2019 as well as growth to 100,000 users before the new year. The demand for physicians and healthcare services is growing with each year, Cape explained, meaning that tools able to increase the output of any single practitioner could make a substantial impact on a burdened health system. At the same time, increasing patients’ access to regular primary care can improve outcomes while limit future costs. “We know that when you introduce a single primary care physician into a population of 10,000 people you can reduce the mortality rate by 5.3 percent, and in fact when a single individual has a relationship with primary care, they are 5 percent less likely to be hospitalized, 6 percent less likely to end up in surgery and on average will save 30 percent on their healthcare bills over their lifetime,” Cape said. 98point6 isn’t alone in turning to new technologies for primary care delivery. Earlier this year K Health launched its free app that offers users insights about their condition, and then links them directly to a local primary care provider. Iora Health’s digital-physical approach to primary care for the Medicare population received a $100 million boost earlier this year as well.